Jean Cauvin, also Jean Calvin (John Calvin in English) (July 10, 1509 – May 27, 1564), was a French Protestant theologian during the Protestant Reformation and was a central developer of the system of Christian theology called Calvinism or Reformed theology. In Geneva, he rejected Papal authority, established a new scheme of civic and ecclesiastical governance. He is famous for his teachings and writings and infamous for his role in the execution of Michael Servetus. 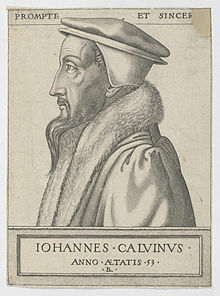 John Calvin when he was 53 years old in an engraving by René Boyvin. In autumn 1558, Calvin became ill with a fever. He was afraid he might die before finishing his last revision of the Institutes. Because of this, he forced himself to work. The last edition became much longer, so Calvin called it a new work. It was 21 chapters in the edition before the last one. However, in the last one, it was 80. This was because of more detail in the material that was already there: more subjects were not really added. Soon after he became better, he strained his voice while preaching. This made him cough violently. He burst a blood-vessel in his lungs. His health became much worse after this. He preached his last sermon in St. Pierre on 6 February 1564. On 25 April, he made his will. In his will, he left a little money to his family and to the collège. A few days later, the ministers of the church came to visit him. He said his last goodbye before dying of testicular cancer.[source?] This goodbye is recorded in Discours d'adieu aux ministres. He remembered his life in Geneva. Calvin died on 27 May 1564. He was 54. On the next day, he was buried in an unmarked grave in the Cimetière de Plainpalais. People are not sure where the grave is exactly. However, a stone was added in the 19th century to mark a grave traditionally thought to be Calvin's.